Do you have a passion? Have you set yourself a challenge? At Brunel we have lots of friends, alumni and supporters who have generously given their time to organise and participate in a wide array of activities designed to raise money for the University. Motivated by a project or research area particularly close to their hearts, from cancer research, autism, Progeria and dementia, to scholarships, sporting excellence and helping disadvantaged young people; our supporters have gone to great lengths to support us. Almost any activity can be turned into a fundraiser. The choice is limitless. Whatever your interest or hobby, from cake baking to skydiving; from running a marathon to organising a quiz night; from a knit-a-thon with afternoon tea to dragon boat racing; there is always a way to turn it into a fundraising event that matters to you . At Brunel University London, the Development and Alumni Relations Office would love to hear from you if you would like to help us raise money for something you care about. The opportunities are endless; from funding research into preventative cures to life threatening diseases, to providing scholarships and bursaries for students. Your support is vital. Give us a call and let us know about some of your tried and tested or innovative and ideas. This is a brilliant way for alumni, the community and other supports to raise money for Brunel and have fun along the way. Sarah Liveing – Supporting the Urban Scholars Programme for talented and gifted disadvantaged young people. This is Sarah’s Brunel story: "On a beautiful June day I set off for Hinton in the Hedges, a quaint sounding place in the Oxfordshire countryside. I was a woman on a mission. It’s not every day that you jump out of an aircraft and I was determined that having decided to support Urban Scholars at Brunel University, I was going to do them proud. Lots of people had sponsored me and I really didn’t want to let them down. I had thought I would be feeling nervous as we drove along the motorway... but I wasn’t. We left the motorway and proceeded along country lanes. Again, I thought the nerves would kick in as we got closer and closer to our destination, but they didn’t. On arrival I was introduced to the instructor to whom I would be strapped. My name went up on a big board and that was it, no going back. I was down to jump on the next available aircraft. All I needed now was the right clothing and some training. Surprisingly there is not much you need to know so training done, I was put in some oversized overalls with a harness. Sporting some funny headgear and goggles, we headed to the plane. I was first on which meant last off. All the while I was expecting to get nervous but I genuinely wasn’t. 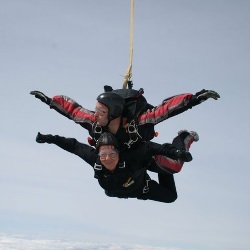 By now I was strapped to my Tandem Instructor and sitting almost on his lap as we ascended to our jumping altitude. The door of the aircraft opened and my fellow jumpers departed leaving just me and my man. We sat on the edge of the plane, legs dangling out. As instructed I tucked my legs between his and I waited for his signal. Tap tap! And we were away. What an exhilarating feeling, soaring through the sky for what seemed like ages but was only a minute. The feeling of weightlessness and freedom is amazing. Then there was the signal that he was opening the parachute and after a brief upward surge, we were meandering back to terra firma. It was an amazing experience which I thoroughly enjoyed. The fact that I was able to support Urban Scholars in this way was an added bonus for me. The support from family and friends was fantastic and raised some much needed funds to support the Urban Scholars programme – a great day out for a worthwhile cause!" “I have found, over the years, that a cake sale is a very lucrative way to raise money for your chosen Charity. At Brunel I am known as the ‘cake lady’ and I organise regular cake sales to raise funds to support Dr Jo Bridger and the Progeria Research team. Progeria is a terrible condition that robs children of their lives, ageing them 10 years for each one year of their natural life, doing what I can to provide funding is really rewarding and one way I can support is through cake sales. The best way to do this is to invite a few key like-minded colleagues who enjoy baking to make a couple of cakes each and donate them to the cause. Always get them to make their favourites, so it is not a chore for them. I find five others to help is about right – but never turn help away as it cuts down on what you need to do. Try and get a variety of cakes, buns and biscuits with some for dietary needs and that way you’ll have an eager audience ready and willing to support and enjoy. Also a good tip is to make sure you have napkins and paper plates (which can all be bought at the £1 shop to keep costs down) to make it easier for your friends to take extra cakes away. I find that donations are the best way to price as most people will drop a £1 coin in the pot. Most cake sales I do will make around £250 - £300. Sometimes we also organise a raffle. This is a great way to recycle unwanted Christmas presents! What could your organisation or company do? Are you looking to adopt a named cause as your “Charity of the Year”? Are you involved in a fundraising event? Does your company offer match funding for money raised? Many organisations support their employee's fundraising efforts through a match funding programme, meaning you can double your donation with your organisation’s support. Did you know that Brunel’s research experts love to shout about their work? They would love to tell you all about their research and would be delighted to speak at an event to help raise awareness and funds. If you are keen to get started or would like to find out about how you can donate the funds raised to Brunel, we would be delighted to hear from you. We are here to help you on your way. We can give you tips, advice and guidance to make your fundraising as straightforward, fun and financially successful as possible. Please contact Clive Gee: clive.gee@brunel.ac.uk or call 01895 267776 to discuss your ideas.